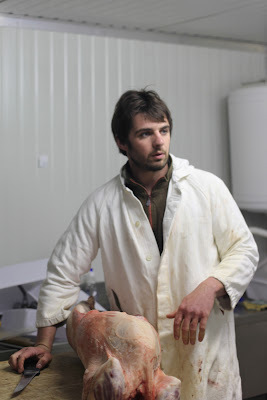 Last weekend our friend Pierre introduced us to Guillaume Verdin, the young man who raises lamb at Ferme de Clavisy, just outside the town of Noyers-sur-Serein in Burgundy. Entering the farm is an experience of pastoral idealism. After turning off the main country road, the driveway curves between small pastures with sheep and cows leisurely grazing. Crossing the gentle Serein river via a wooden bridge, the ancient stone farmhouse and first barns come into view, with the farm's fertile acres rolling out to the horizon. 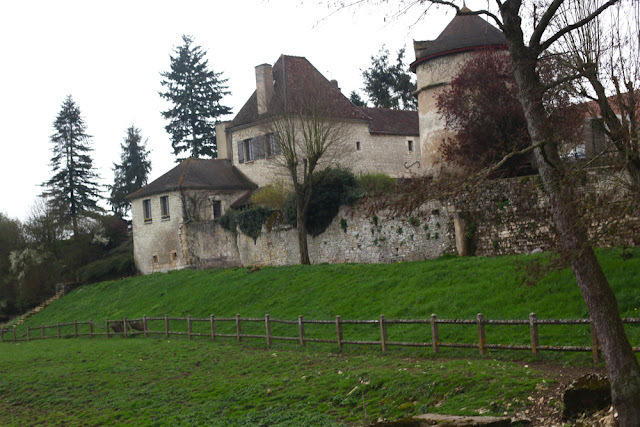 Founded and built by the Verdin family at the end of the 17th century, the farm has stayed in the same family and made it's way to through the generations to Guillaume. 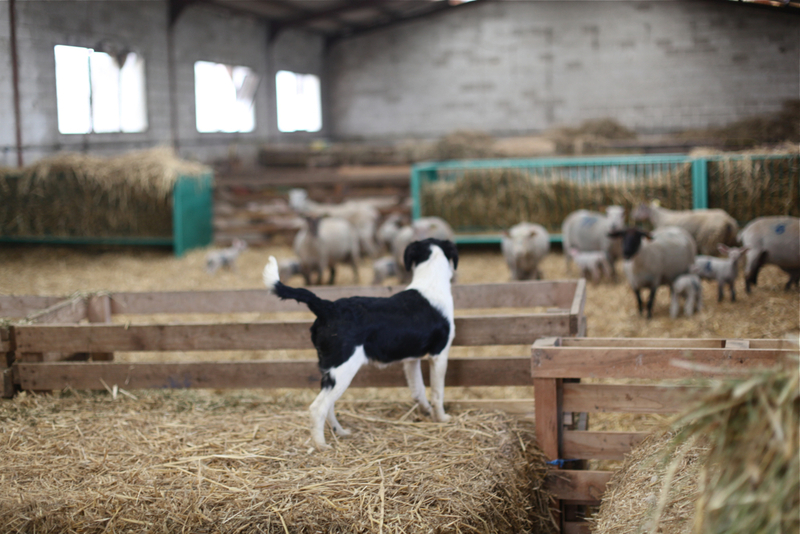 Stepping out of the car, we were greeted by a pack of friendly dogs of many sizes, who scrambled and loped around us as we walked into the first of two large bergeries that house the lambs and their parents. There is an unavoidable giddiness that comes with being at the center of a large building filled with newborn and very young lambs. 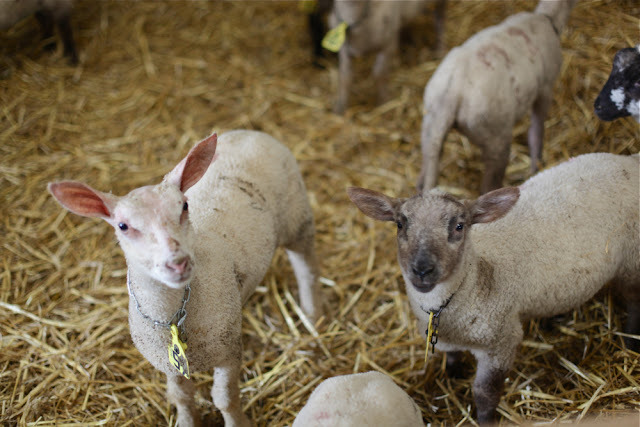 Amid the high-pitched, human-sounding bleats and the fumbling bounces and wobbles of newborns taking their first steps, it's easy to see why the lamb has secured a spot as the symbol of innocence, sweetness, and springtime joy. Guillaume is very proud of the dietary regime he has designed for his flock. 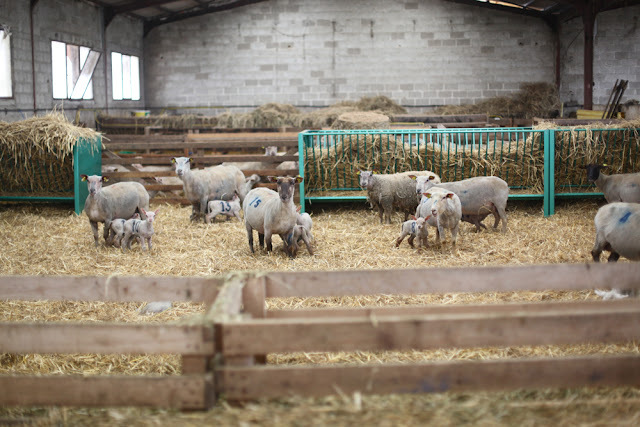 Unlike many lamb farms that buy feed, Guillaume grows over sixty percent of what his lambs eat. I had a hard time keeping up as he rattled off the ingredients in the mix, but I know it included hay, alfalfa, various grains and herbs, and even, I think, juniper berries. After staring at the lambs for who knows how long (tearing Danielle away from the bouncing newborns was no easy feat), we walked back to the farmhouse and into the small shop. 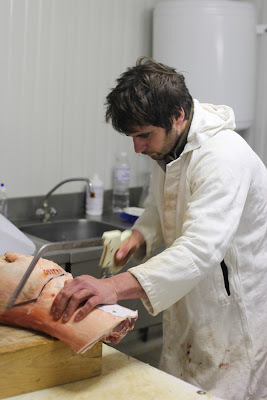 From the walk-in refrigerator, Guillaume pulled down a whole lamb and we selected two côtelettes which he nonchalantly butchered for us. 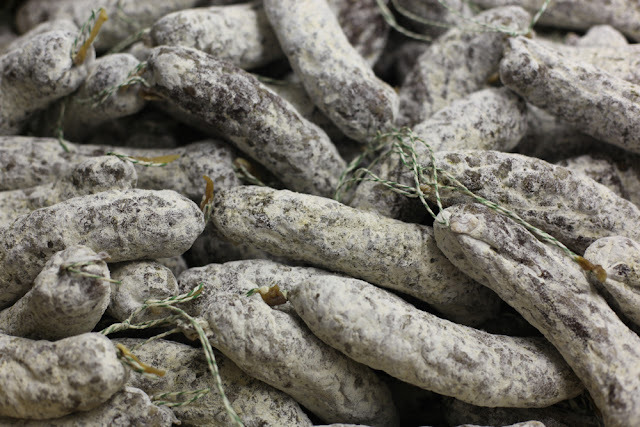 On the way out, we couldn't resist a few dry-cured saucisson as well. Later that night, Danielle masterminded the preparation of aforementioned côtelettes. 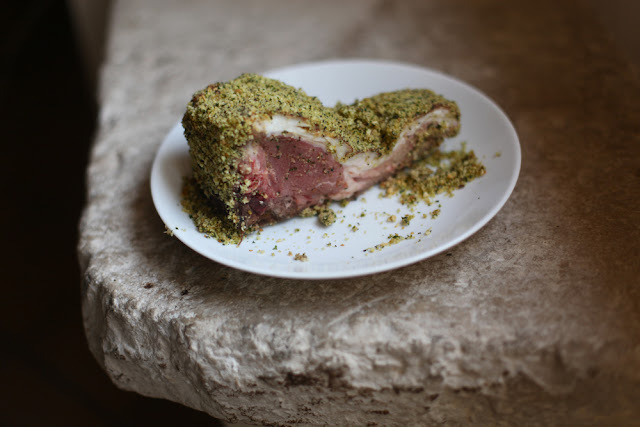 Seared in garlic butter, slathered in Edmond Fallot mustard, then crusted with fresh-cut herbs and breadcrumbs, finished in a hot oven. There isn't any other way to put it: this is the best lamb I've ever eaten. Just before leaving the farm we heard a faint yell from across the field and Guillaume sprinted off. A few minutes later, he came back, soaked from the chest down. 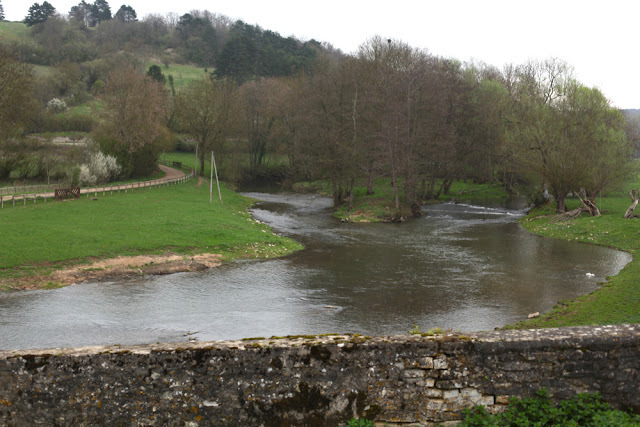 The yell was from his mother, and the reason was that one of the wily young puppies had pushed a sheep into the river. The sheep was unshorn, and had to be fished out of the water by Guillaume. "This sheep still has thick wool, and the water can absorb and drown her," he explained. 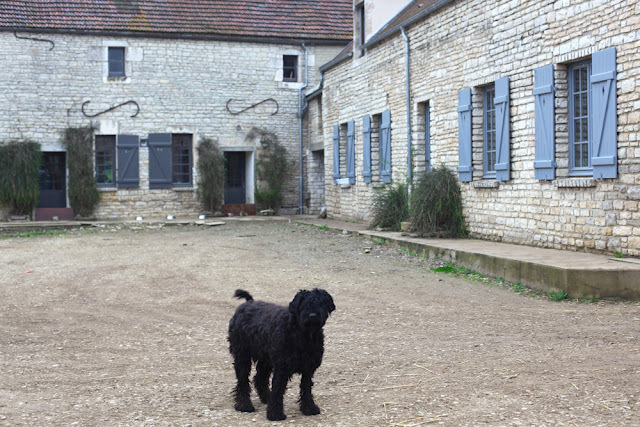 The dopey happy puppies continued their endless scramble as we drove away, knowing that all's well at the Ferme de Clavisy.